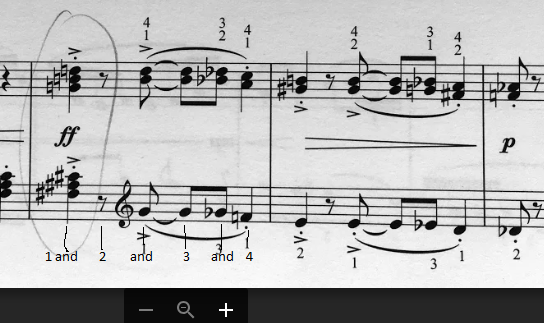 I have a short, totally non-musical, exercise with a tricky rhythm at the last couple of bars and I cannot see if I am right or wrong. I would really appreciate if someone could help me with that. PS. I can usually figure it out. The bars I have problem with are 7 and 8. PS2. I could not embed the image so I just added links. I also added a mp3 file, so that everyone could listen to me. Last edited by Celdor; 02/12/19 01:51 PM. If you're not on, you're pretty damn close, I count it 1 & 2 & 3 & 4 & with rest on the 2 and coming in 1st 8th note on the 2& holding through 3& then 4- 4& for the last quarter note. Counting it out loud your tempo may be speeding up a fraction? that measure? Nerves? Or it may be right on, but you've got the rhythm pretty close. FYI I don't play piano to that level, but I did 6 years of flute so reading music I'm not too shabby. Last edited by HollyBytheLake; 02/12/19 02:00 PM. Thanks for your comment.I feel from your response that I am not correct rather because of my technical capability of playing it. I have tried this with metronome and I am always slightly off -.- little fast, little slow etc. I am also not interested in a total perfection of that. I am more interested in how I read rhythm. It is syncopated and this is where it catches me. Cheers! The rhythm is basic - crotchet (written as two quavers tied) , quaver, crotchet. It looks harder as there is a quaver rest. Also all rhythms are doable with slowing down very much and crefuk counting.